This little dress and legging combo is from Next. My mum bought it for Rosalie the other week. The leggings came in a two pack with this cherry coloured pair and an aqua polka dot pair. I like this outfit as it’s nice and comfortable for Rosalie to wear around the house or for when she is playing the garden. This week Rosalie pulled herself up to standing whilst holding onto the sofa. This girl is climbing all over the place so I like the fact her arms and knees are protected. Rosalie’s bib is from Asda. 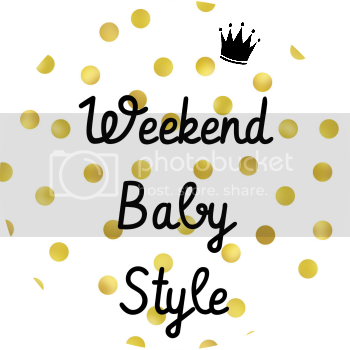 If you’d like to join in with this week’s weekend baby style link up you can do so here.